The Bee and Station Hotel was built in the 1860s. The decorative tile work of the exterior was probably added during remodelling c.1890. Inside, the lobby is also richly decorated with brightly coloured tiling. The building was listed in 1991 as an excellent example of pub of the late 19th century with a complete tiled frontage and a rare surviving internal layout throughout. In the 19th century it was known as The Bee Hotel. The first trade directory to refer to it as The Bee and Station Hotel was in 1932. The gilded lettering in the fanlight of the arched doorway reads “Bee Commercial Hotel”. The Bee was home to Rhyl’s popular Jazz Club in the early 1960s. It attracted people from along the North Wales coast and Chester on Tuesday nights. After it had ceased c.1964, the back room at the Bee became home to Rhyl Folk Club for the next 34 years. 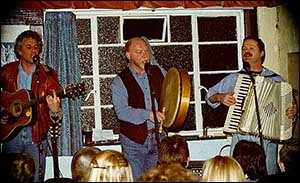 The photo shows local group Rum, Bum and Concertina. The pub closed in 2005. The building reopened in 2013 after being refurbished and given a modern extension by Denbighshire County Council, under the Townscape Heritage Initiative, to provide new offices for small businesses. One of the tenants is the Lego Innovation Studio, run by the G2G Communities social enterprise to encourage children and young people to take an interest in engineering. The resident groups – Common Thyme, Mint Julep, Beez Kneez, and Rum, Bum and Concertina – brought great pleasure to folkies of Rhyl and district, and beyond, writes Ruth Pritchard. So too did the stalwarts of the British folk scene who played at the Bee. Although the Bee became increasingly run down, many people cherish memories of Friday nights in that atmospheric back room – the music, the dark, the smokiness, the fun and the camaraderie. The folk club moved out of the Bee and Station in the 1990s and celebrated its 50th anniversary in 2014.